This Ain’t Your Momma’s Flourless Chocolate Cake! It’s never really “today in the kitchen.” Cooking something and posting about it in the same day never seems to workout in the Parisienne Farmhouse. But this cake was enjoyed by the family a few weeks back in celebration of our anniversary. And OH! Did we enjoy it. I always try to keep a completely unhealthy amount of butter in the house and I try to keep a hidden stash of dark chocolate around for when the urge to make a french style chocolate cake hits! Sadly, there was no Valhrona in the cupboard but a handful of german bars from Aldi…ugh, I know…but they did the trick and they were only .25 a piece! Or just your every day 3pm chocolate craving? 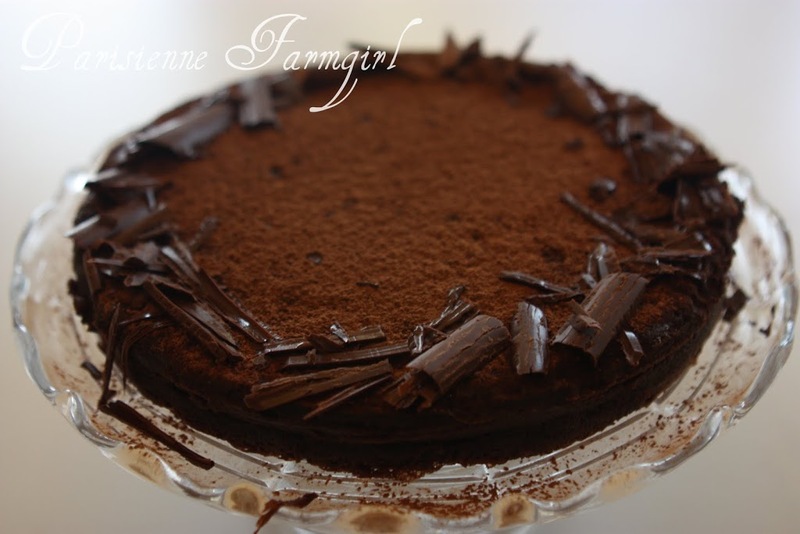 You simply must try this cake! Get out your favorite cake plate and preheat the oven to 325. Lightly butter a 9 inch spring form pan (3 sizes pack for $14 at Target) and line the base with non stick baking paper. Butter the paper and sprinkle with sugar and tap out the excess. 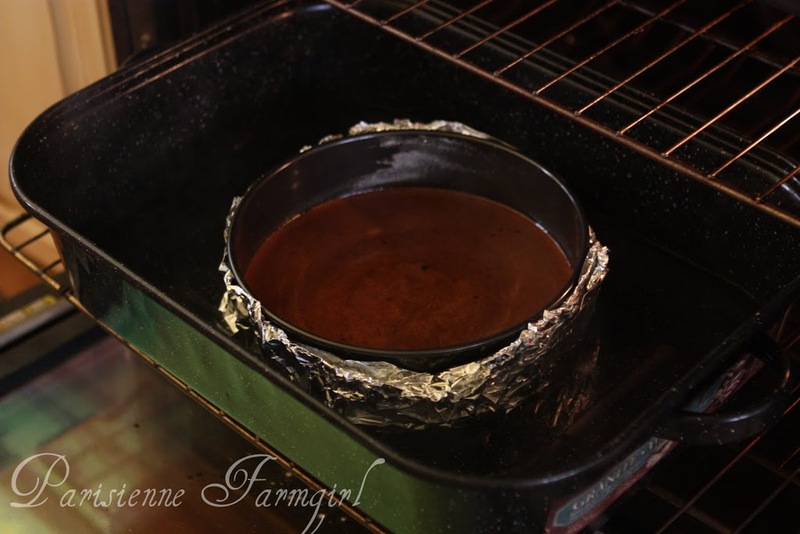 The cake is baked in a bain marie or water bath so carefully wrap the base of the pan with two layers of foil to prevent water from leaking into the cake. 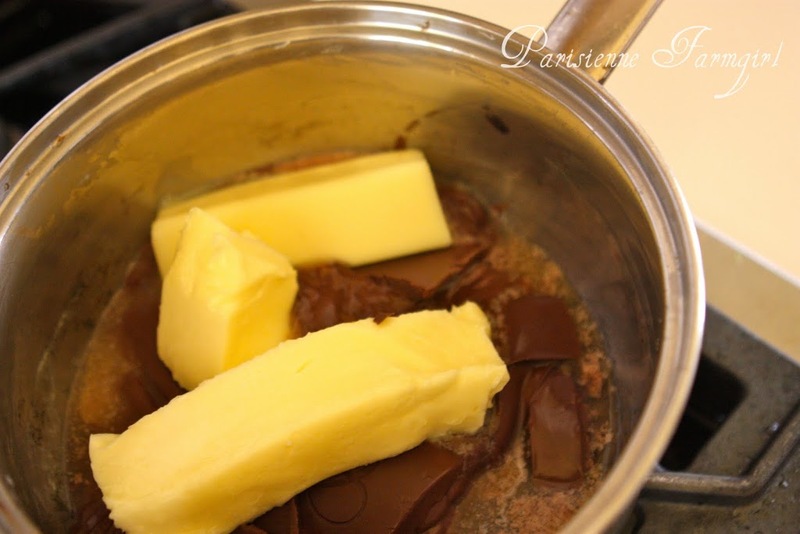 Melt the chocolate and butter in a saucepan over low heat until smooth (try not to drink it!). Then remove from heat. Beat the eggs and 1/2 cup of the sugar with an electric mixer for 1 minute. 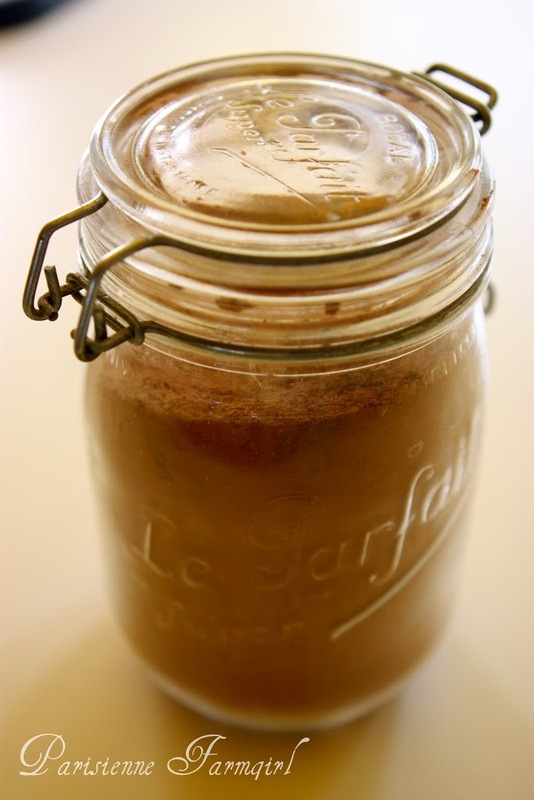 Mix together the cocoa and the remaining 1 tbsp of sugar and beat into the egg mixture until well blended. Beat in the vanilla extract, then slowly beat in the melted chocolate until well blended. Pour the mixture into the prepared pan and tap gently to release any bubbles. Can you stand this jar? I found it at the Thrift Shop a few months back – it says “Le Parfait Made in France” for goodness sake so it just HAD to host my Cocoa Powder! Place the spring form in a roasting pan and pour in the boiling water to come 3/4 of an inch up the side of the wrapped pan. Bake for 45-50 minutes until the edge of the cake is set and the center still soft (a skewer inserted 2 inches from the edge should come out clean). 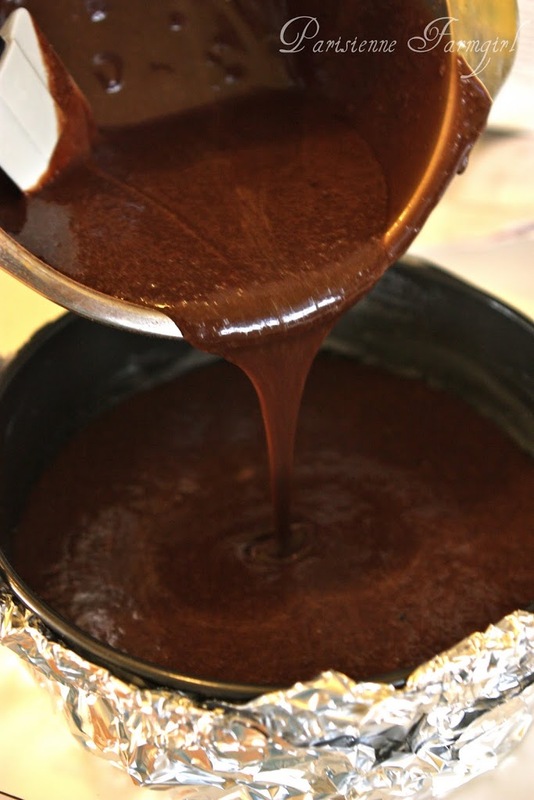 Lift the pan out of the water, remove foil and place on wire rack, remove the sides of the pan and let the cake cool completely (you can tell by my melting chocolate and wet spots on my cocoa powder that I DID NOT wait long enough) . Invert the cake onto the wire rack. Remove the base of the pan and the paper. Dust the cake liberally with cocoa. I do this by gently placing a few spoonfuls in a sieve and shaking it evenly over the cake. Arrange the chocolate shavings around the edge. I used a single blade cheese grater to shave my chocolate but make sure your chocolate bar is big enough to handle while you are shaving and that it is nice and cool. The next time I make it I will be covering it in lemon curd and then completely covering the top with gorgeous raspberries!!! Can’t wait for THAT one! Try not to eat the entire thing yourself. I think I would be lovely with fresh, homemade whipped cream! Recipe adapted from “French” by Carole Clement and Elizabeth Wolf-Cohen. Do you offer shipping to California? you ARE bringing that to the party right? just for the hostess? with my name on it right? I almost licked the screen! Thanks so much for this! I made a flourless cake with splenda before and it was wonderful, I’m eager to try your recipe! Great for those of us trying to eliminate flour from our diets. I made your last chocolate cake and it was delicious. I like the chocolate shavings on the side of this one. It’s so pretty! I made an “almost” flourless cake a few weeks ago…very similar, only it had 1 TBL of flour in it. So delicious! I think it was Julia’s, tho I can’t be certain. Yes, the jar is awesome! Can I just say Y.U.M.!!! I’ll really have to try this! Your blog is just lovely! 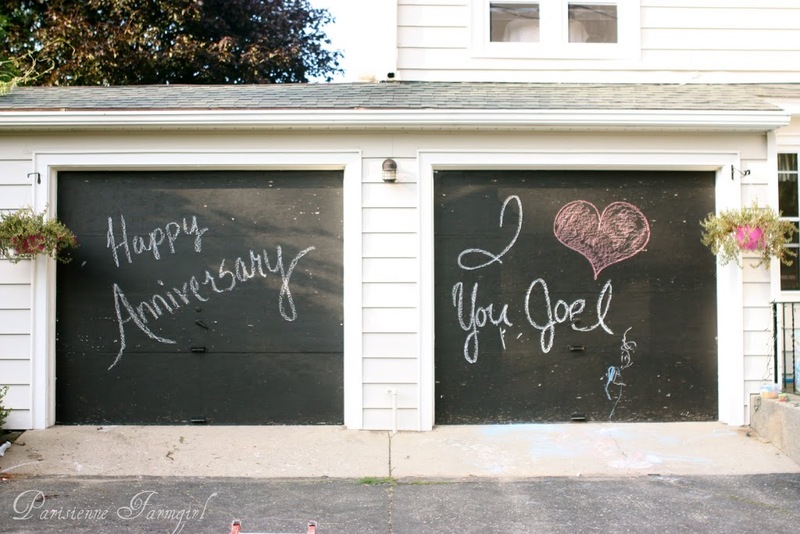 Thanks for sharing the love!! !